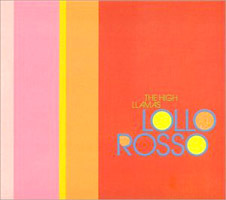 This is the only High Llamas CD that I ever had; it’s is a little EP with remixes from Mouse On Mars, Cornelius, Jim O’Rourke, Kid Loco, Schneider TM, and Stock, Hausen & Walkmen all of whom (except the last, I think) seemed to be constantly remixing each other at that point in time with homogenously bouncy results – I feel like I have most of these remixes in several places. The Mouse On Mars sounds like Mouse On Mars, which is still pleasant, Cornelius sounds like Cornelius (some samples he’s used elsewhere, I think) and is still nice. The Schneider TM is low-slung and electronic, never really grabbed me. I didn’t appreciate Jim O’Rourke (now graduated to the Whitney Biennial) and thought he was boring; this particular remix goes through about six different styles and lasts too long. Kid Loco I used to like; now this seems tasteful if dull, call it trip-hop and be done with it. Stock, Hausen & Waterman were always stupid. And there’s a High Llamas remix at the end which is pretty and like the Beach Boys with occasional space noises, but, hmmm, predictably so. It’s mostly cute, but . . . I believe I got this during the year I took off school when I was living in Union Square in Somerville. I had a little room just larger than the size of my bed, which was full of books mostly, as I was, ostensibly, taking the year off to get some reading done, which I did, though I wound up working a great deal too. That door to that apartment was never locked, as far as I remember; can that be right? I do remember that my room had a broken window that I never bothered to fix: at the start of that year, I didn’t have any money (why? ), and by the time I did, I think, it had warmed up. It was an odd way to live. Another project for a blog overloaded with projects: here I shall attempt to go through the massive pile of old, and in some cases mouldering, CDs that I’ve been lugging around from various place to the current place, listen to each, if possible, and to try to figure out (in writing) why I got the CD and what happened to me when it was around. This is largely because there are quite simply too many CDs, and it seems like it would make sense to just burn them to disc, which I’m doing in the process. In method this owes something to somebody I knew in the co-op, Charles Messing (not, alas, this Charles Messing entangled with crinoids), who would, while I was washing dishes, regale me with the plots of dreadful-sounding movies from the late 1970s and the 1980s, lovingly entangled with his own life. I don’t know what happened to Charles, but I’m sure he’ll turn up sooner or later. One will immediately note that the vast majority of the CDs are rather dreadful, but that does tend to happen, I guess. The vast majority of these predictably never get played; should you want one, tell me & I’ll happily give it to you, the resale value of CDs at this point being practically nothing. 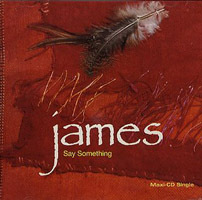 This is a single by James, who were (and perhaps still are) a British band. My friend R.J. liked them when I was in high school; how he started liking them, I don’t know, but he briefly obsessed over them. I had a couple of their CDs towards the end of high school (they were produced by Brian Eno, they had covered Leonard Cohen, both of which meant something to my nascent sense of credibility) and remember, weirdly, listening to them late at night on the drive to college, I think the only time I made the drive with my parents. I was reading, at the time, Angela Carter’s The Infernal Desire Machines of Doctor Hoffman, a book I utterly and completely failed to understand at the time. This single was probably bought soon after I got to college, when I was overjoyed at finding record stores that had what I thought were obscure things (in this case I don’t think it was that obscure at all, but such things simply didn’t exist in the rural midwest). I feel like I bought this at the semi-underground record store that was part of the Garage on JFK near Mt. Auburn St., though I don’t remember at all what it was called, though I do remember disappointment when it was turned into a Motophoto. Was it the old Newbury Comics? I don’t know. This particular single: not so great. A radio version of “Say Something” (a bright, poppy single, which at the time I would have felt guilty about enjoying). A dreadful slowed-down acoustic version of “Laid” which was James’s one big song (but which was not a big song in rural Illinois, it bears pointing out). Then: two remixes. One by Utah Saints which is short and sweet, a pumped-up gym version of the single, which keeps threatening to break into ’92 hi-NRG techo-pop and doesn’t quite manage to do so. Some nice diva wailing at the end. Probably at the time I thought there was something not quite right in liking music like this, though I think even then I liked this. Finally: a long trance-y remix by Hardkiss, which bored me because it took out most of the vocals, vaguely dark + menacing, still boring.